The Wall Street Journal published an opinion piece yesterday claiming that “mounting evidence” suggests the Healthy, Hunger-Free Kids Act (HHFKA), which is up for reauthorization in Congress this year, is falling short in its attempt to provide children with healthy school meals. The piece went so far as to suggest that the new school food standards are actually leading to higher rates of childhood obesity. We realize that HHFKA, which passed in 2010 with bipartisan support, has become a partisan issue, but really? Our biggest bone to pick with the piece is not necessarily its opposition to HHFKA (while we clearly support it, we’ve heard all the counter arguments before), it’s the absence of any actual evidence supporting its claim, as well as a seeming lack of understanding of the issue as a whole. To that end, we’ve offered some counterpoints below. HSC: As we’ve written before, there has been a lot of evidence to the contrary from independent bodies such as the Atkins Center for Weight and Health, the Food Research and Action Center and the Rudd Center for Food Policy and Obesity, among others. Studies published by these groups suggest that students prefer the new, healthier school meals; school meal participation is trending upward; and children are consuming more fruits and vegetables at school and throwing away less food. It’s easy to cherry-pick a single anecdote, as the op-ed did, but it’s more useful to look at the actual data. 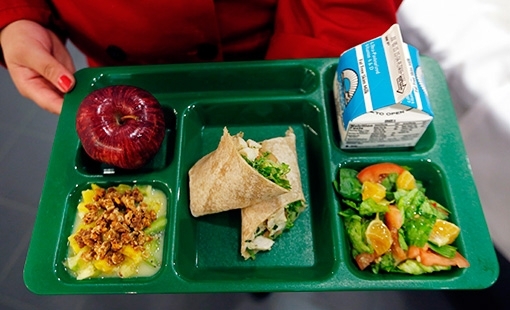 In this case, the data paints a broad picture of improving school food programs nationwide. HSC: The provision referred to here is USDA’s Community Eligibility, which allows schools with high percentages of low-income children to provide free breakfast and lunch to all students. The provision increases student participation in the school meal program, and allows schools to balance the costs of extra meals with the savings of reduced labor and paperwork. This is an innovative program that helps direct our tax dollars toward serving children rather than getting mired in wasteful overhead. HSC: As any parent knows, kids are a tough audience to serve. Getting kids excited about healthy food is an especially difficult task. We should be applauding — not criticizing — schools and districts for thinking outside of the box in an effort to get kids invested in healthy food. Why wouldn’t you want to keep up with the latest food trends? Take, for example, what the D.C. public schools did through their student food ambassador program and themed food stations. If the programs work (and they do) and especially if there’s available grant funding to set up the program (which was the case with the Minneapolis program referenced above) we say keep it coming! HSC: While HHFKA passed in 2010, implementation did not begin until 2012. And some important parts of the plan, such as the Smart Snacks in School standards, were just recently rolled out. Childhood obesity is a major issue that needs to be systematically addressed at school, at home and within our communities. HSC: We’re not sure what “supervising every bite” means; perhaps it’s a reference to the science-based nutrition standards that are the foundation of the school nutrition guidelines? But we just spent three days in Washington, D.C., with 27 high school students who were part of our Cooking up Change program. This much is clear: Students do want healthy, great-tasting food at school, and they deserve nothing less. The point to be made here is not that HHFKA is perfect (but were school meals prior to HHFKA something anyone really yearns for? ), it’s that our schools can and need to be part of the solution to childhood obesity by fostering a healthy environment for students. A big part of that is ensuring that all children have access to nutritious school meals that fuel their learning and growth, and HHFKA has put us on that path.